The country's largest automaker, MSIL has finally launched its awaited sedan, Ciaz in the market. 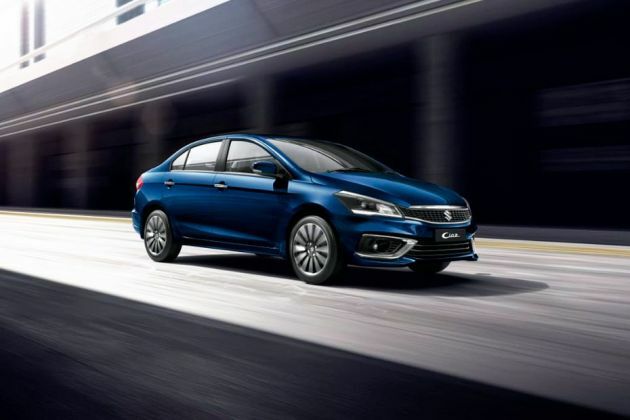 It is offered with both petrol and diesel engine options and will compete against the likes of Honda City, Skoda Rapid, Nissan Sunny, Volkswagen Vento, Ford Fiesta and other vehicles in this segment. It is available in several trim levels, out of which, Maruti Ciaz ZXi is the top end variant in its petrol lineup. It is fitted with a number of striking features, which includes a bold radiator grille with a lot of chrome treatment, a sleek bonnet, well designed headlight cluster and so on that gives it a decent appearance. At the same time, its interiors are designed in such a manner that gives the occupants a pleasurable driving experience. The automatic air conditioning unit has climate control and there is a rear AC vent as well. This variant is powered by a 1.4-litre petrol mill, which is skillfully mated with a five speed manual transmission gear box. It has the ability to generate a maximum power of 91.1bhp in combination with 130Nm of peak torque output. Its braking and suspension mechanism are quite efficient and it keeps the vehicle well balanced at all times. The overall dimensions of this sedan are quite standard. It is designed with a length of 4490mm along with a total width of 1730mm and a decent height of 1485mm. The minimum ground clearance of this vehicle is 170mm. It has a 43 litres fuel tank and a 510 litre of boot space capacity. This stylish sedan has an aerodynamic body structure, which is designed with a lot of chrome treatment and strong character lines. The frontage has a bold radiator grille that is fitted with a few chrome slats. It is embossed with a prominent company logo in the center. This grille is flanked by a neatly carved headlight cluster that is incorporated with projector lamps and side turn indicators. The body colored bumper features a wide air intake section for cooling the engine and it is flanked by a pair of bright fog lamps. The large windscreen is integrated with a set of intermittent wipers. Coming to the side profile, it is designed with pronounced wheel arches, which are fitted with an elegant set of 15-inch, multi-spoke alloy wheels. These rims are further fitted with high performance tubeless radials. Its door handles and ORVMs are painted in body color, while window sill gets chrome treatment. The external rear view mirrors are electrically adjustable and fitted with turn blinker. Its rear end is elegantly designed with an expressive boot lid that is embossed with variant badging. It also has a body colored bumper that is fitted with a pair of reflectors and a radiant tail light cluster. The windshield is integrated with a defogger and a centrally located high mounted brake light. The dual tone internal section of this Maruti Ciaz ZXi variant is quite spacious and is incorporated with well cushioned seats, which are covered with premium fabric+leather upholstery. These seats are integrated with adjustable head restraints and provide ample leg space for all occupants . Its second row seats are foldable, which help in increasing the boot volume of this sedan. The wood finished center console and dashboard further enhances the look of its insides. This trim has a number of utility based aspects like cup and bottle holders, front seat back pockets, remote fuel lid opener and a spacious boot compartment. The illuminated instrument panel houses a digital tachometer, an electronic tripmeter, a low fuel warning light along with other warning and notifications. This particular variant is equipped with a 1.4-litre K-series petrol engine, which comes with a displacement capacity of 1373cc. It is integrated with 4-cylinders and 16-valves using double overhead camshaft based valve configuration. It can churn out a maximum power of 91.1bhp at 6000rpm along with a peak torque output of 130Nm at 4000rpm. This motor is cleverly mated with a five speed manual transmission gear box, which sends the engine power to its front wheels. It allows the MPV to attain a maximum speed of approximately 155 Kmph and can accelerate from 0-100 Kmph in close to 15 seconds. This petrol mill in incorporated with a multi point fuel injection supply system, which helps in delivering 20.73 Kmpl on the bigger roads. Its front axle is assembled with a McPherson strut, while the rear axle is fitted with a torsion beam type of mechanism. Meanwhile, the front wheels are equipped with a set of ventilated disc brakes and its rear wheels get conventional drum brakes . It also has anti lock braking system, which helps in enhancing its braking mechanism. This trim is blessed with a rack and pinion based power steering system. It is tilt adjustable and makes handling convenient even is heavy traffic conditions. This Maruti Ciaz ZXi is the high end trim in its model line up and is bestowed with a number of sophisticated features. It has an advanced in-car entertainment system, which comes with six speakers. This audio unit supports CD/MP3 player, radio with AM/FM tuner, USB interface, Aux-in port and Bluetooth connectivity. Its leather wrapped steering wheel is mounted with audio and call control switches. Some other aspects include an automatic climate control unit with rear AC vents, all four power windows with driver side auto down function, sun visors with vanity mirror, power steering and several other aspects. The list of features include speed sensing auto door locks, remote central locking system, reverse parking sensors, height adjustable driver seat, rear defogger, high mounted stop lamp, S-TECT body structure, an advanced engine immobilizer with anti theft security system, front fog lamps and ABS. It has seat belts for all passengers along with driver seat belt reminder notification on instrument panel. For enhancing the safety in case of any collision, it is also equipped with airbags for driver and front co-passenger. 1. Impressive exteriors with striking features. 2. Spacious internal cabin with lots of comfort features. 2. Price can be competitive.